I am in to busy today. Busy with colour that is. It feels like we are being made to wait for spring to arrive, and all I want to see is the magical colours of spring! How about you, are your ready for some spring? 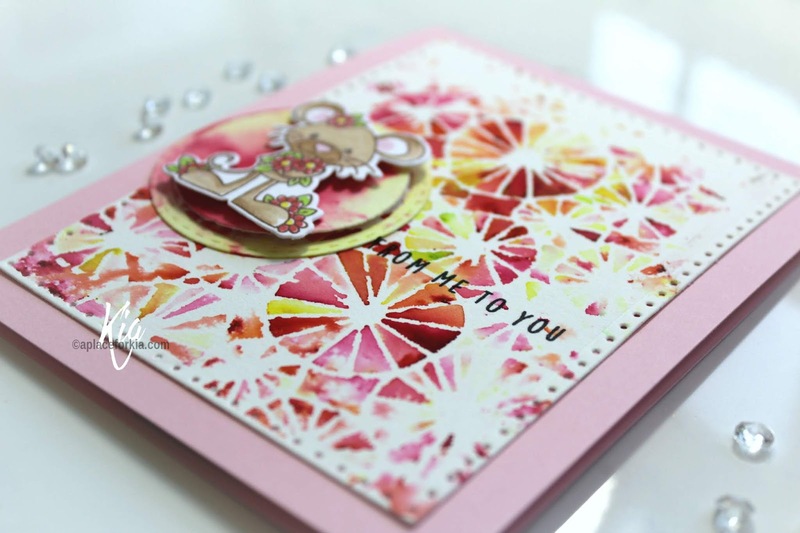 You can find spring in this card, the little mouse from Pink and Main has spring flowers popping up everywhere. I stamped the mouse using Ranger Archival ink in Sepia and coloured using Copic Markers. 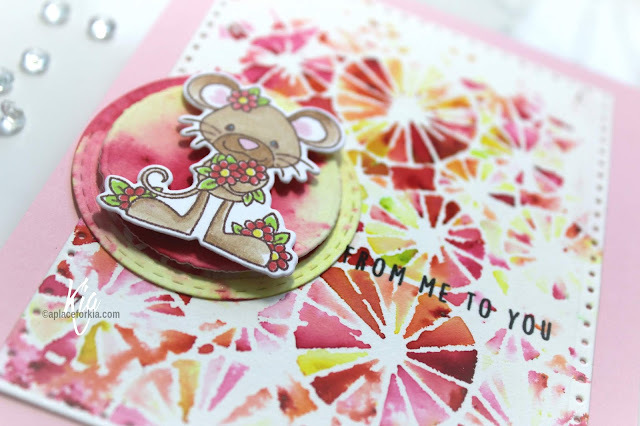 The background is bursting with colours done with Color Burst Powders and a stencil from A Colorful Life called Doodle Wheels. The Color Burst colours I used are Chartreuse, Alizarin Crimson, Tangerine, Fuchsia and Orange. I did the stencil prints in both positive and negative, using the negative on the inside of my card. I die cut both panels with my Sizzix Dotted Rectangle Die set. To display the mouse I painted a die cut circle with left over colours that were on my desk, dragging the circle through the colour. I then die cut the circle again using a deckled die for the second cut. I attached the inner circle using foam squares and also used a foam square to attach the mouse. For the inside I again used a circle die cut for my sentiment along with the background die cut panel. 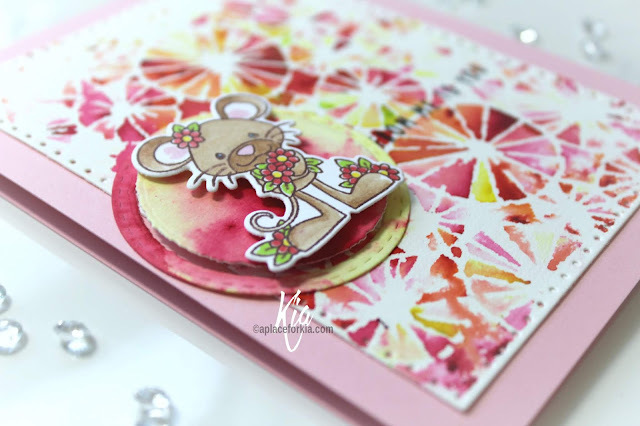 It is always fun to make bright and happy cards, and I hope you enjoy this card as well. As a reader of my blog you are entitled to a 10% discount when shopping at A Colorful Life Designs - enter Kia10 at checkout. Following are the products used for today's card with affiliate link provided. I greatly appreciate your support.